I recall Rocky Balboa once saying “Boy, sometimes charity really hurts,” after a tough battle with Thunderlips, but if he thought that was bad, try stepping onto the court with former tennis greats Pete Sampras and Andre Agassi. The two were teamed up with Roger Federer and Rafael Nadal for a doubles match over the weekend and things got a little ugly, to say the least. Thankfully, because it was a charity match, all the players were given microphone headsets so that every word could be heard loud and clear. It all starts at about the 1:05 mark. 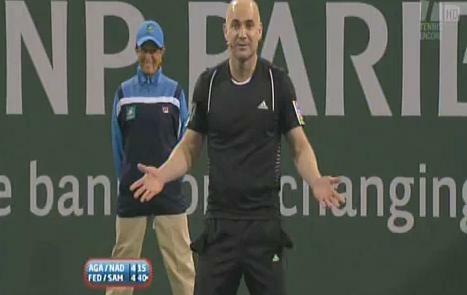 After Sampras and Federer take the lead for the first time in the match, Agassi pointed out to his counterpart that he “always has to get serious.” So after a double-fault, Pete decided to lighten things up by imitating Andre’s pigeon walk around the court. The crowd seemed to get a kick out of it, however, Agassi did not, and fired back with an impersonation of his own, emptying his pockets as if to imply Sampras was cheap. The entire charade continued over the next couple of minutes, with Andre mocking Pete’s poor tipping and apologizing to Obama. It is obvious that Sampras and Agassi do not like each other, but what is lost in this entire charade is the fact that Nadal and Federer were forced to sit through it all. At least it isn’t the first time either of them has had to put up with an awkward on-court moment.